The Carolina Elephant's Foot flower is truly spectacular. 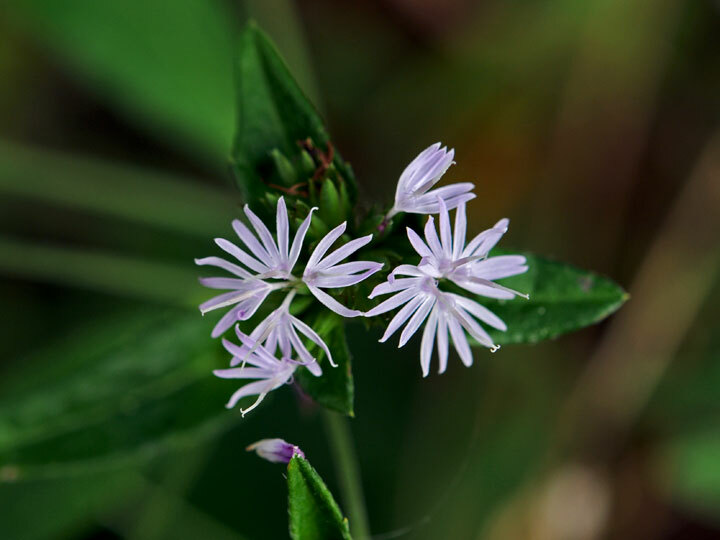 This native wildflower can be found in moist woody areas in the southeastern part of the United States. They are commonly seen in the woody areas in North Carolina, Kansas, and Missouri. The plant gets its common name from the large flat leaves at the base of the plant that resembles an elephant's foot. In fact, the genus name Elephantopus characterizes plants with this characteristic. The base leaves of the plant can be as large as 8 inches long and 3.5 inches wide. The flower actually does not have true petals; rather there are several disk flowers. In late October, the lobes of the disk floret or what looks like petals, dry and turn into seed clusters that are a brown maroon color. The Carolina Elephant's Foot is a perennial flower that blossoms between July and October. The blossoms range from white to a pale violet color. The full height of the plant ranges from 12 to 40 inches. These flowers grow fairly quickly. Certain parts of the Carolina Elephant's Foot flower are poisonous if ingested. Therefore, the wildflower is deer resistant.